As a reminder, in the last video, Part 5, we learned how to attract more website visitors. That’s a great start, but we both know, unless we can turn an increasing number of those website visitors into leads and customers, that new website traffic is pointless. If you’re like most manufacturers, or B2B companies, you’ve undoubtedly relied on an RFQ and Contact Us form on your website to generate leads. Unfortunately, nothing says used car salesmen more than sliding a contact us or RFQ in front of a website visitor in the awareness stage of their buyer’s journey. To turn today’s buyer into a website lead, you need to add value. You need to continue to help them. Much like we used educational content on our blog, to attract our buyer persona at each stage of their buyer’s journey. To convert them into leads, we need to up the ante a bit on our educational content or add value with the content we’re already offering. follow many relevant accounts to build our social reach and promote our new content. Our first lead generation opportunity, should come from our newly created pillar content. Recall that a pillar page is a VERY long, thorough piece of content that covers all of the most common questions around a broad topic. The example we used in the previous video was ‘plastic injection molding’. Because this content is sooooo long, many readers won’t have the time right now to read the whole page, BUT they’ll want to be able to refer to the information easily, later. They could also be viewing the page on their phone and want to wait to read the whole thing from a larger screen or kindle. To turn this visitor into lead, we can request their email address, and other optional information, to send them the PDF. We’ve now generated a lead, and we didn’t have to ‘sell’ them. All we did was add value. Leveraging the example from our previous video, if you’re a plastics manufacturer, you probably have the knowledge to produce a simple ebook called, ‘The Guide to Planning an Injection Molded Part’. 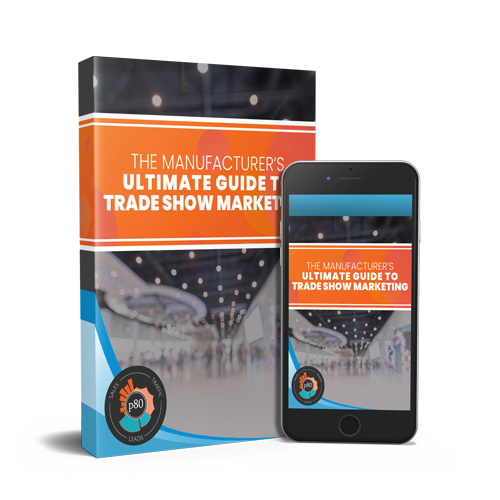 This guide would be highly relevant to your plastic injection molding pillar content and topic cluster, so it would be another great lead generation offer. The key here is to take your blog content, and pillar content, and think of what your buyer persona’s next steps might be, within the context of their buyer’s journey. If it’s awareness stage content, you don’t want your premium content to be decision stage. It should be more awareness stage content, or consideration stage. For a refresher on the buyer’s journey stages and examples of how to use it, check out video 4 of this series. Hopefully you’re starting to get a clear picture of how we’re continuing to use content within the inbound marketing methodology to attract and convert visitors into leads. Helping them through their buyer’s journey. If you conceptually understand how a visitor Googles a topic, lands on your site, and decides they want premium content, or to email the pillar page PDF to themselves, you’re doing great! 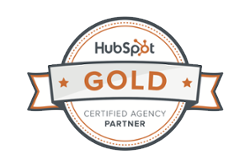 A short answer is the HubSpot Marketing suite, which is what we use here at p80, and nearly all of our clients use. If you aren’t ready for HubSpot, you can use WordPress with a suite of plugins called Inbound Now, Gravity Forms, and MailChimp, it’s just not nearly as intuitive, comprehensive, or easy to report on. Have you ever been to a site where the content you’re viewing gets kind of grayed out and a window shows up over top offering you something? Or maybe you’re reading a page and a small offer slides in from the bottom corner? Those are called Lead Flows. You might be thinking, but those are so annoying! And in some cases you’re right. They’re especially annoying when they don’t have any relevance to the page you’re reading. BUT, when they are extremely related to what you’re reading, or they allow you to advance your research, they are VERY helpful to the reader and your lead generation efforts! Again, we recommend HubSpot. The free version includes Lead Flows, and is extremely intuitive. You can select the pages you want your lead flows on and specify parameters that trigger the lead flow to show, such as scroll position on the page, or time viewing the page. 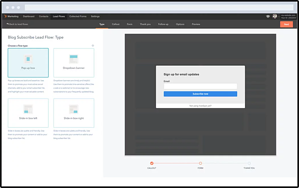 The lead flow allows the visitor to complete a form right in the popup or slide in window to get an offer, which generates a lead. Lead flows are sort of an all-in-one tool for getting the visitor’s information, using content. The other pieces I mentioned, all work in tandem. When a visitor reads a blog post or pillar page, they have to be alerted to the fact that there’s a premium offer or added value for them. That’s where Calls to Action come in. We’ll use a graphic or button call-to-action (CTA) to direct them to download the premium offer. Think of a CTA as mini-billboard meant to grab the reader’s attention and direct them to do something. Technically speaking, these are just buttons or images that link to a landing page with a form, where the visitor can enter their contact details in exchange for the premium offer. must include a form where the visitor can enter their details. A little about the form. The form on your Landing Page should use the buyer’s journey context, much like your content. If the premium offer the visitor is downloading is an awareness stage offer, keep the form very minimal with things like company email address, first name, last name, and optionally their company. If the premium offer is more decision stage, ask a few more probing questions that will help you in the sales process. But keep in mind that the more you ask, the fewer people will fill it out. Techniques like progressive profiling can be helpful here, where you progressively ask for more details from them as they download more content from you. A notification should be sent to the appropriate people on your team, maybe sales, to research this lead and see if we should follow up. A Thank You email with a link to the premium offer should be automatically sent to the lead, and ideally they should be entered into a lead nurturing workflow (more on that in the next video). The lead should then be redirected to a Thank You page with a link to their premium offer, and a ‘Next Step’ offer up-sell. I’ll link a video in the description below that shows how a lead is generated with the Inbound Marketing methodology. It walks through a visitor finding a site through Google, all the way through turning into a lead. Again...HubSpot’s Marketing tool does all of this setup with a step-by-step system. It does everything it can to simplify the process, and because it’s all in one tool, the reporting is phenomenal. You can do this without HubSpot, but you’ll need to know how to put the pieces together that I mentioned earlier, to get it to work. So how does the Convert stage fit into the first 3 months of your Online Marketing Plan for Manufacturers? Make a branded PDF version of the page. You can use Microsoft Word or Google Docs for this. Create a landing page with a form that highlights the benefits to prospect of downloading the PDF. Create a thank you page that allows the lead to download the PDF. Create a CTA button or image that promotes the PDF version of the Pillar content. Add the CTA at the top, middle, and bottom of the pillar page. Create a lead flow for the pillar page PDF and set it to display on the appropriate pages of your website and/or blog. Test a lead flow with varying triggers on your new, relevant blog posts. Alright, hopefully you have a better understanding now of how we integrate lead generation in the Convert Stage of our Online Marketing Plan with the Attract Stage. I recommend going back and watching the Attract Stage video, if need be. You’re also welcome to ask questions in the comments below! In the next video, we’re going to iron out how we’ll turn these new leads into customers with lead nurturing and inbound sales tactics.